I love to write but don’t always want to prepare and post a new article every week. I enjoy posting something of value every day on Facebook but sometimes I would rather do other things. However, I do both as perfectly as I can because I have a goal and to reach it, I have learned that there must be consistency in my effort, for as long as it takes. Consistency is a principle with power. When we do simple things consistently, over time, we will achieve amazing results. This principle can be found in cultures all around the world and in most, if not all religions. 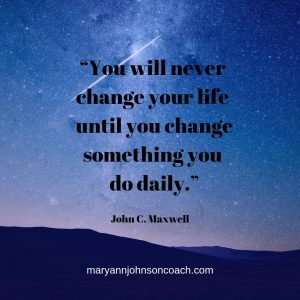 But this is a challenging principle to live because what we really want is a silver bullet, one big thing that will bring us growth, change, or success. It’s amazing we ever believe the silver bullet myth because the truth of small steps over time has been restated and demonstrated so often. But the myth is comforting. It’s what we want to believe because the truth is harder to accept. Why would we rather do one big thing to change our lives? Although the big thing may take a massive effort on our part, if we gave the effort, then the work would be done. But the truth is we have to decide to do it and then follow through—over and over and over and over . . . ! There is no one and done. 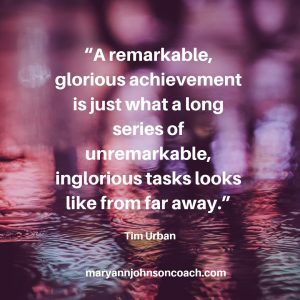 Whenever you hear that a person has achieved an extraordinary goal, rarely, if ever, are you told the process they used—that is, the ordinary actions they took consistently. You only hear about the outcome. We’re led to believe extraordinary successes in business, home, or life are a result of significant actions, but they’re not—they’re a result of daily actions done consistently over time. I worked with a single mom who was struggling with her children ages eight, eleven, and fourteen. They were argumentative and disobedient. One of her sons was withdrawn, and other people commented on how hyper her kids were. There was a fair amount of chaos in the home. As we talked this mother realized that to have what she wanted in her family she would need to be more consistent. But being consistent in anything was a challenge for her. So, she picked one thing that she would do consistently in her home so she could practice living this principle. She occasionally read to her kids, but it was rarely successful. However, she chose this to experiment with. As she began reading aloud to her children, it didn’t appear it was going to work out well. The kids were restive and quarrelsome. But I encouraged her to keep it up no matter how it looked or felt because the goal was to practice consistency. Her job was to provide a comfy spot and to read, no matter how her kids behaved, and to do it consistently. So, she did. She committed to reading to her children twice a week. They would all gather in her room, in the middle of her bed and they would read. It wasn’t always easy, but as time went by it became more and more enjoyable. The surprising part is they began to have a sense of cooperation and peace while they read together, and this feeling moved into other areas of their lives. They felt it at mealtimes, in conversation, and when working together. People began commenting that her children seemed more patient and calmer. Her withdrawn child seemed happier and had begun to sing around the house. Remaining Present while a child grows, not checking out because of discouragement or feeling overwhelmed, is dependent on doing simple things consistently rather than searching for a one-time fix to family issues. It takes time and practice to make lasting change and to grow as a person or as a family. • We must commit to it. • We need to consistently do the work. • We must believe we can accomplish it. • It’s important to remember that consistent is not the same as perfect. • Keep your word to yourself. Do what you’ve decided to do. Consistency long term is the key. We must commit to giving any issue time and consistency. Don’t allow discouragement and don’t quit! Time doesn’t equal failure. It equals eventual success.